Work: Elected to the Continental Congress, 1775-1778; Judge, 1783-1798. 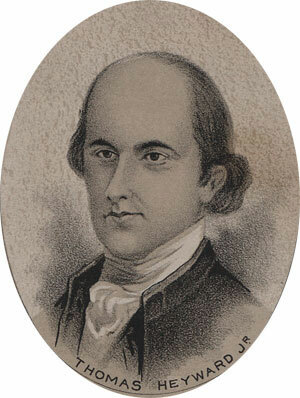 Thomas Heyward, Jr. was born in South Carolina in 1746. He received a classical education at home and continued in legal studies, which he completed in England. In 1775 he was elected to the Continental Congress, where he signed the Declaration of Independence. In 1778 he returned to South Carolina to serve as a Judge. He was taken prisoner by the British while in command of a Militia force during the siege of Charleston. He resumed his Judgeship following the war, and retired in 1798. He died in March of 1809 at age 62.